Dr. Suess & Nano Science, Really? The annual Read Across America Day coincides with the birthday of Dr. Seuss. The National Education Association’s nationwide reading celebration takes place at thousands of museums and libraries this weekend as well as on Monday, March 2. This year’s theme focuses on the Seuss classic, Oh, The Places You’ll Go. For anyone who appreciates art, loves science and a good story, Theodor Seuss Geisel, much better known as Dr. Seuss, is a hero. He was born March 2, 1904, and is known for his 46 children’s books, including such classics as The Cat in the Hat, The Lorax, Green Eggs and Ham, and my favorite, Horton Hears a Who. 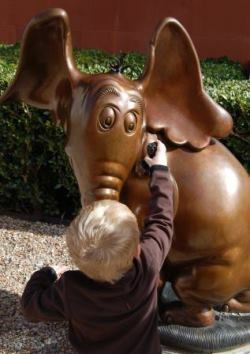 A special moment in the sun where Horton Hears A Who outside the Museum of Science & Industry in Fort Worth, Texas. So what do Dr. Suess and nano science have in common? NanoDays also held in March has an obvious connection to Dr. Seuss. As my favorite 10 year-old explained to me, “Think tiny, tiny, I mean really tiny, less than micro and you will have nano.” His best example for me was the book Horton Hears a Who. The example, though not highly scientific, makes sense to me. NanoDays is a nationwide celebration of nanoscale science created to enable participants to imagine, discover, and explore a world that’s too small to see. I feel like Horton would love the idea. Each spring at the very end of March more than 200 children’s museums and science centers, across the country host engaging events combing nano science with storytelling, interactive activities, and family fun. What parents really need to know is that in the future nano science will play a big part in the wellbeing of our planet. So it pays to get children interested and excited about the possibilities offered by nanos. Maybe start by reading Horton Hears a Who. But for this weekend maybe I will find a copy of Oh, The Places You’ll Go.